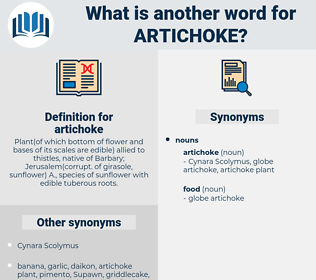 What is another word for artichoke? Plant( of which bottom of flower and bases of its scales are edible) allied to thistles, native of Barbary; Jerusalem( corrupt. of girasole, sunflower) A., species of sunflower with edible tuberous roots. Artichoke bottoms, slowly dried, should be kept in paper bags. Imagine a gigantic artichoke with slender instead of broad leaves, set round in dense compact order. arduous, aertex, artois, aortitis, ardisia, aerides, art deco, aortic, ards, arts, arethusa, air attache, air attack, Artie Shaw, airdock. 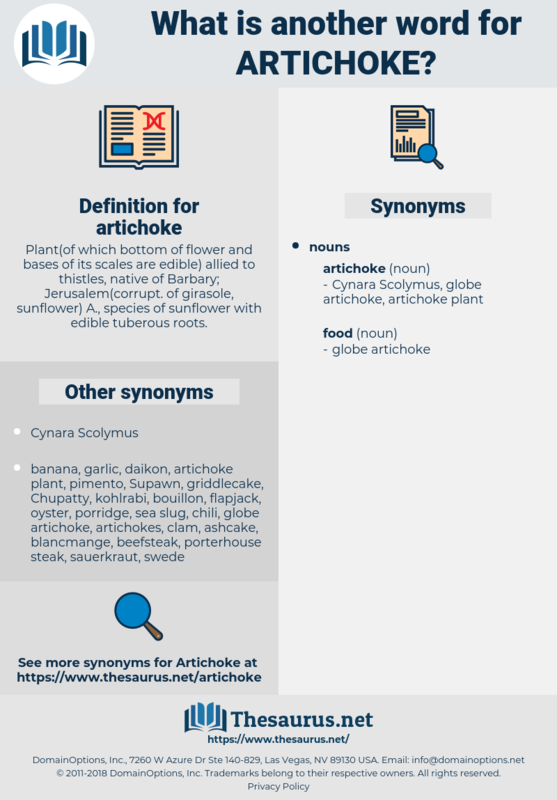 artichoke plant, Cynara Scolymus, globe artichoke, artichoke.